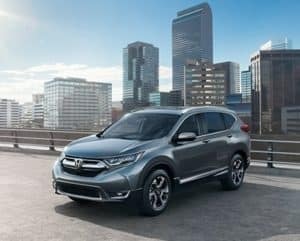 This page is the perfect place to start if you’re considering a Honda CR-V for your daily rides through Abington, Willow Grove, and Glenside. Here, you can find an overview of this SUV. Plus, the resources on this page will take you to Honda CR-V reviews that dig deeper into its specs and features. Each one was created by the team at Sussman Honda to make the research process even easier for you. When paired with a 2-wheel drivetrain and Continuously Variable Transmission, the Honda CR-V gets an EPA-estimated 28 MPG city/34 MPG highway.1 Plus, the turbocharged engine offered with this configuration also delivers 190 horsepower. Of course, the CR-V is also incredibly adaptable. With the option for 2-wheel drive or all-wheel drive, plus two engines and four trim levels to choose from, you can personalize this SUV with the specs that match your lifestyle. Thanks to high-tech features available in the CR-V, you can unlock the doors, open the liftgate, drive to your destination, and lock your car again—all without even taking the key out of your pocket. Plus, a standard multi-angle rearview camera makes it easier to see where you’re going when you’re backing up. When it comes to entertainment, Bluetooth® streaming audio and Pandora® compatibility come standard, along with a 160-watt 4-speaker audio system. Upgrade your CR-V for even more connectivity options and audio enhancements. 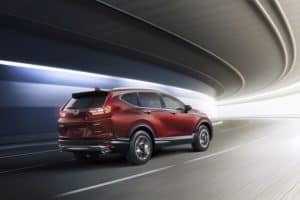 This SUV is packed with active and passive safety features, earning it the title of IIHS Top Safety Pick: MY19 Honda CR-V.2 The CR-V is designed around an Advanced Compatibility Engineering™ body structure to keep you safe in the event of a collision. Standard active safety features include Vehicle Stability Assist™ (VSA®) with Traction Control and a Tire Pressure Monitoring System (TPMS). Not only does the available power liftgate offer the option for hands-free access, but once it’s open, there’s plenty of space to transport everything you need. The Honda CR-V offers up to 39.2 cubic feet of rear cargo space. When you need more room, fold down the 60/40 split rear seats to get up to 75.8 cubic feet of cargo volume. The spacious cabin is also great for taking your family or friends on a road trip. With over 40 inches of front and rear leg room, everyone can sit comfortably, no matter which seat they’re in. Plus, an automatic climate control system keeps the cabin at just the right temperature. To get a complete look at everything this SUV offers drivers in Abington, Willow Grove, and Glenside, follow the links on this page for more detailed Honda CR-V reviews. Once you’ve read it all and you’re ready to take the next step, visit Sussman Honda for a test drive—contact us today to schedule your appointment! 1 26 city/32 highway/28 combined mpg rating for 2WD LX trims. 25 city/31 highway/27 combined mpg rating for AWD LX trims. 28 city/34 highway/30 combined mpg rating for 2WD EX, EX-L & Touring trims. 27 city/33 highway/29 combined mpg rating for AWD EX, EX-L & Touring trims. Based on 2019 EPA mileage ratings. Use for comparison purposes only. Your mileage will vary depending on how you drive and maintain your vehicle, driving conditions and other factors. 2 Trims with front crash prevention features and specific headlights.